Thank you for your interest in one of Blackstock Ford Lincoln's online offerings. 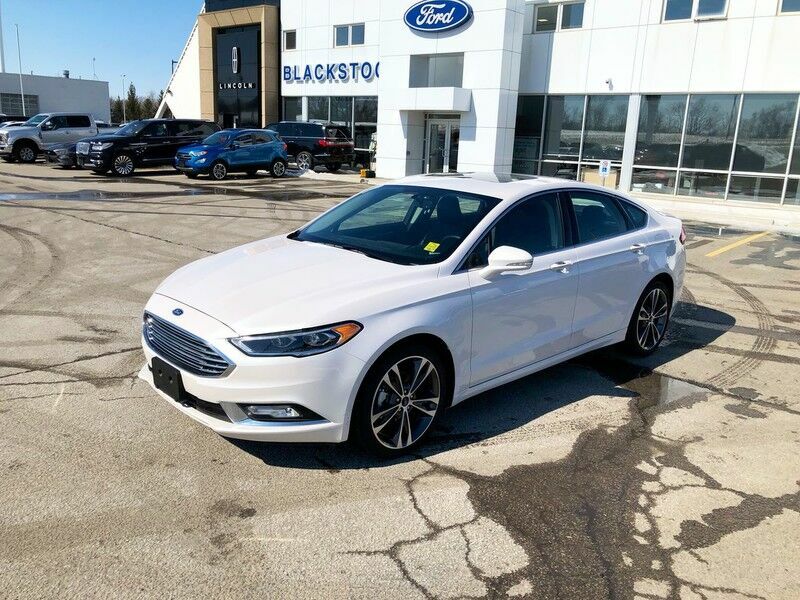 Please continue for more information regarding this 2018 Ford Fusion Titanium with 16,761km. This Ford includes: WHEELS: 19" MACHINED FACE ALUMINUM Tires - Front Performance Aluminum Wheels Tires - Rear Performance WHITE PLATINUM METALLIC TRI-COAT POWER MOONROOF Universal Garage Door Opener Generic Sun/Moonroof Sun/Moonroof COOLED DRIVER AND PASSENGER SEATS Cooled Front Seat(s) Heated Front Seat(s) Leather Seats *Note - For third party subscriptions or services, please contact the dealer for more information. * This vehicle has an added performance bonus: AWD. It improves handling on those winding back roads, and gives you added safety and control when driving through wet and snow weather conditions. Just what you've been looking for. With quality in mind, this vehicle is the perfect addition to take home. Beautiful color combination with White Platinum Metallic Tri-coat exterior over Ebony interior making this the one to own! WHY BUY FROM BLACKSTOCK FORD LINCOLN Our motto is "You Drive Us To Be Different" What does different mean? Live Market pricing competing fairly with integrity Readers Choice Multiple Year Winner Best New Car Dealer, Used Car Dealer, Auto Service Centre for Dufferin County The purchase price is just the beginning. We do not sell or recommend Protection Products that do not have integrity. We do not sell Rust Modules, only Rust Check Spray. The products we do offer, we do not hire third parties. We are direct and approved centre for 3M Paint Protection Film and Ceramic Window Tint. GTechniq Smart Surface Science for Paint and Interior Surfaces We do not sell any product or warranty that we have a hidden ownership stake in. Financing and Leasing Solutions that offer the best rates available that treat everyone fairly and with integrity. Used Vehicle Reconditioning that goes well beyond safety standards. Example brakes with at least 40% wear remaining (Certified Pre Owned 50%). We only offer Extended Service Plans from Ford Motor Company. FINANCING AND CREDIT - Our credit team will work hard to secure you the most favourable terms for you. Your privacy is assured and regardless of your credit rating , simply click the Get Financing Button for a pre-approval quickly and easily. Everyone who handles your application is licensed by OMVIC , the Ontario Motor Vehicle Industry Council.